Berisas Boston Terriers of New Jersey, welcomes you to come in and look around. My husbands name is Bernie and I am Lisa Kanuck, we thought it was pretty clever our kids came up with our name BER-ISAS. Ber short for Bernie and isa's short for Lisa's put it together we have Ber-isa's. We liked it so much we kept it. Here at Berisa's Boston Terriers of New Jersey, we are Breeders of some nicely bred Boston Terriers. I'm a pretty small breeder and only have as many dogs as I can play with and socialize I have 5 inside and outside kennel runs with heat and air condition .they all take turns and come into my house and have there puppies in my house were I can watch them closely and to have one on one time hanging out with us and getting socialization skills with us and watch tv which they absolutely LOVE to do.in the summer they get doggie pools to splash around and have fun in. i am very clean and my little guys are well taken care of and love everybody. I have 3 + beautiful wooded acres to take walks on and tons of agreage all around me to walk thru. I've been raising healthy, AKC, Champion line puppies in New Jersey since the early 1990's. I was raised around Bostons with my wonderful Grandmother "ZELLIE NEWSOME" who has left an imprint on my life. She has since passed and I so miss her, she took care of me like she was my mother , she saw good in everything and everyone she was my inspiration , my teacher and my rock. She raised Bostons and played around in the show ring abit. I acquired my Love for dogs thru her . I thought i'd have alittle fun myself so now i'm getting MY feet wet by starting to show alittle bit myself. I figure since I have shown horse's for years in Rodeos and local show grounds etc.. why not give it a whirl and try handling my own dog in the dog show world and see if it's fun. UPDATE: Ok so I tried the show thing . I have a Gorgeous,Champion Boston Boy but honestly showing my horseswas somuch more rewarding and fun to do So Showing is just not for me. OUR GOAL: Is to Breed Beautiful Boston Terriers that Bare Good Health, Intelligence, Good Temperaments and of course GOOD LOOKING. We strive for each and everyone of our puppies to get a wonderful family to share their life with and to get a great home with a warm lap to curl up on. 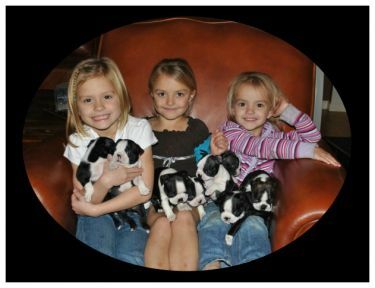 The puppies are raised in our home and are kept in a very clean environment, they are handled and socialized . Even though ALL of our puppies go to loving family pet homes (not as breeding animals), We feel Honored that we have had a couple of our puppies that grew up and went on to become AKC CHAMPIONS. Can you believe that !? AND One of our Lovely puppies even had his picture taken on the front of our AMERICAN FLAG for the INDEPENDENCE DAY PARADE ON FOX NATIONAL NEWS. We feed a good quality puppy food Our dogs Look and Feel Great with their Shiny Coats . UPDATE, dog food has gotten so expensive lately we have decided to experiment abit. we are trying Diamond extreme with no soy no corn no gluten and mixing Nupro in it along with salmon oil and also mix in meat and fresh eggs so they get a good varity so there not bored BUT We always seem to go back to bil-jac but were gonna give it a try. Our Guarantee: 1 year congenital guarantee, Juv.catract, along with a vet certificate that each and every puppy has been thoroughly examined by our vet. The puppies have had their first shot and wormings, AKC paperwork limited as family pets only, not as breeding animals, copy of pedigree, and been cared for with love and socialized. The puppies are fat, healthy and bouncy. I will also be updating pictures of your puppy and send to you at 4 weeks old and 6 weeks old so you can watch him grow. Please understand that Deposits are NON refundable for ANY reason unless of course something were to go wrong while in my care or they were to not pass there vet check. Be sure you are ready to make the commitment of adding a puppy to your life I work hard at producing beautiful well tempered healthy happy puppies and spend majority of my time with them. When we except a deposit from you that specific puppy is being held for YOU ,I will not offer him or her to anyone elsa.